We haven't been people-watching for a bit, partly because I freeze my fingers taking photos at -21C (-6F)! But last weekend temps rose to -8C (17F), so let's watch Montréalers, out on a sunny but still-wintry weekend. Men and women alike bundle, but we see the first hints that the next season beckons. Her dots on yellow lift a wintry grey puffer and wink at spring. "Girls can wear pink, too", she says. Her mother told me she loves rose et jaune. She's come from yoga, now en route to skating. 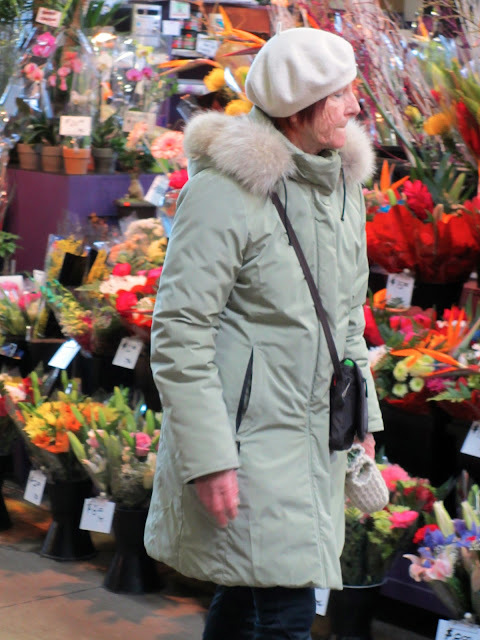 Her treasured parka, from the Northwest Territories, is appliqued in traditional motifs. Our conversation began in French, switched to English and ended with bonne journée, typical here. Bob "Elvis" Gratton is a comic character in several films and a TV series; "Think big, 'sti!" is his catch-phrase, like Austin Powers' "Yeah, baby!" 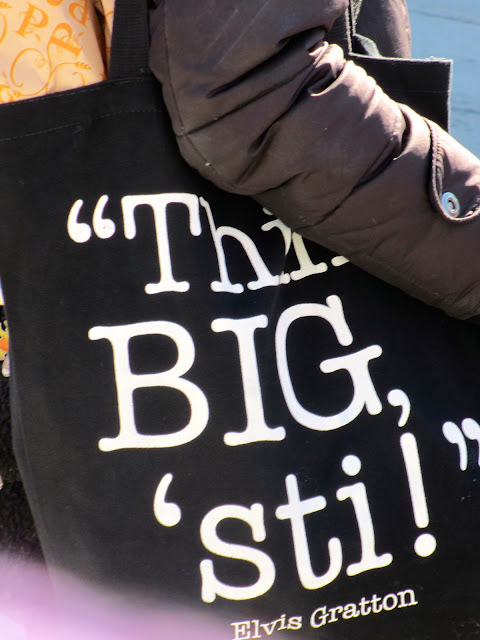 'Sti" (variants include esti, asti, osti) is explained here along with other classic Quebec swear words you wouldn't use around your mother. 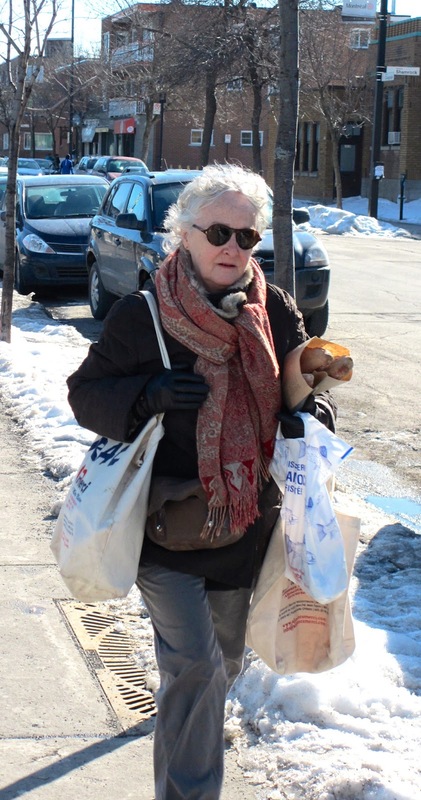 Note the accessories: Cool shades, luminous white hair, plush, Indian-patterned scarf (we supersize here)–and baguette. 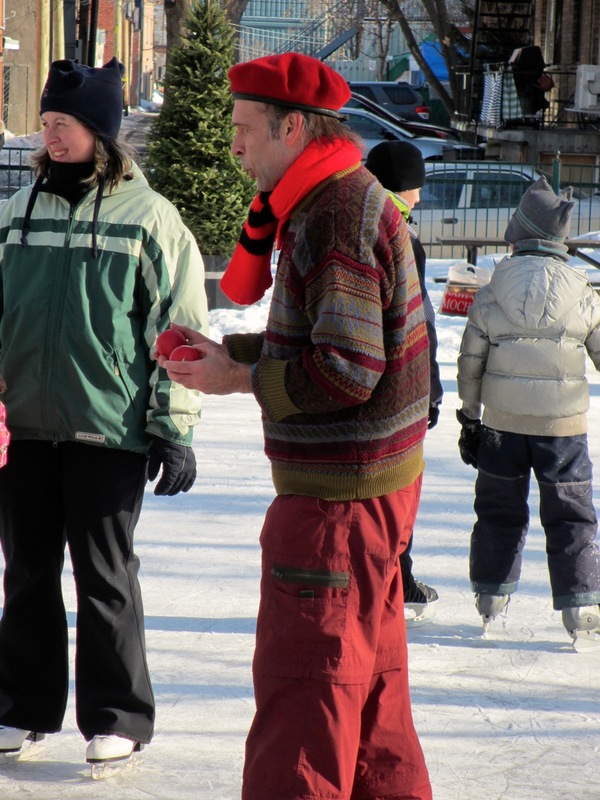 In the park across the street from my place, a jaunty man teaches a girl to juggle while skaters glide around them. Let's watch, then come in for a cup of Euphoria! Next stop, spring! Six weeks until it shows up on people's backs, though I did see a young man on the street with knee-length stovepipe shorts over leather leggings, everything black. Yes, I did! Love the baby girl...you could swim in those eyes! In San Antonio, spring has begun...but we are in desparate need of rain...I actually wish we couldve worn winter wear a bit longer, but the weather is beautiful. Our daffodils are blooming here but it is still cold and shivery. The photo of the lady with the baguettes is my favorite of these. She is stylish and has bread. What more could you want? Oh your Montréal-ers are so stylish! I love how they incorporate a bit of color. And that bébé...just beautiful!!! Such fun to see how people dress in other parts of the world. No need for puffy coats here. 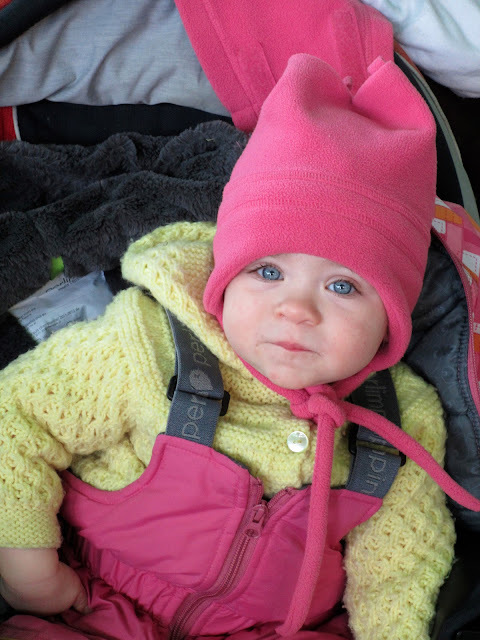 That baby is beautiful and the pink brings out the blue of her eyes. 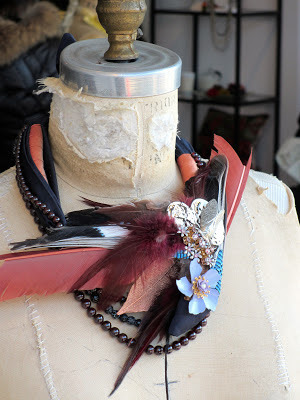 That jewelry shop must be a treasure trove if that necklace is any indication of what else they make have in stock. Pearls perhaps? Adore seeing on-the-street photos! 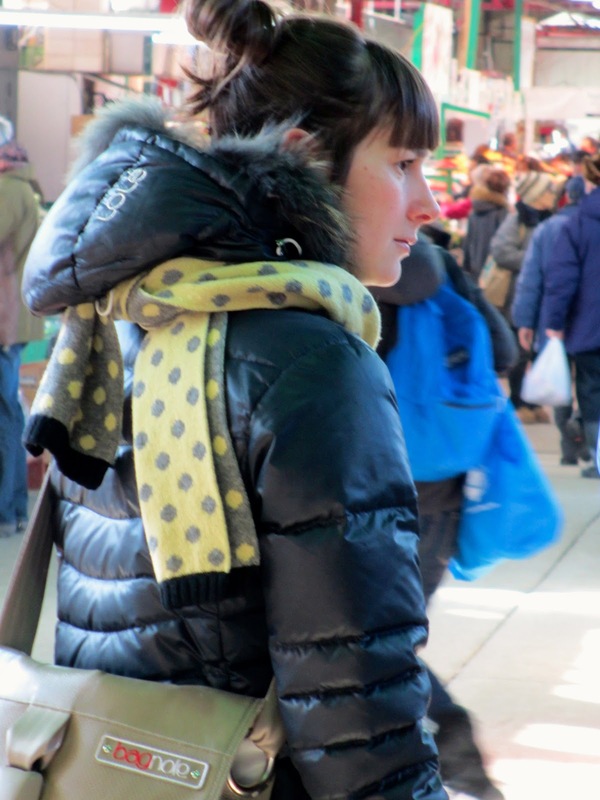 Even in winter Montréalers are so stylish, not like here in northern Vermont. Ahem.... 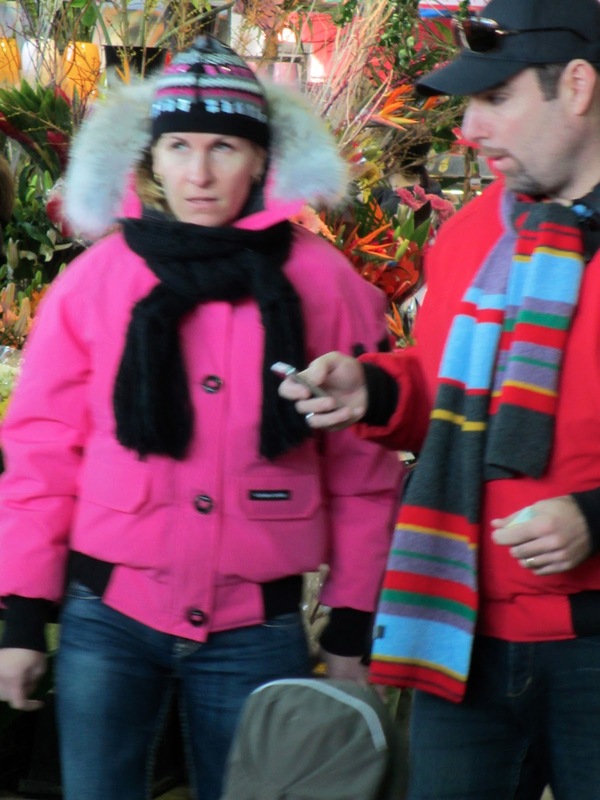 I think the person in the hot pink coat is not a "fellow." Love the snow! Pam: I fell in love on the spot! Julie: Maybe a smile but I caught her unawares. Pseu: Yes, and also I was hunting for colour. Darla: We have an enormous temperature range here. hostess: Alas, they sell glass pearls, but the boutique is very "in". materfamilias: At last I have my bargaining chip: yours of Harriet and Nola for mine of Montréalers! Mean Mama: It is the urban effect vs smaller towns. Both can look great but there is a difference. LauraH: I'm seeing them worn both ways. One thing I do notice is how many scarves are the size of baby blankets. sisty: Not sure he is jolly or good, but- that is a fellow. I'm very happy to find a Mtl blogger who is with it! Mtl is my home , but I now live in Ottawa -- affectionately know as "toque town" because of its lack of style. But we did have our own "International Fashion Show" last week and it was great to see. Wonderful street photos! I regret not getting to Montreal this winter. We are not near spring yet either in Maine.